Here are a few interesting employment facts from the latest release (thru September 2015) of the Quarterly Census of Employment and Wages (QCEW). Why is data that is already six months old so interesting? Fair question. For a quick answer, see the note below. For starters, the Kansas City Metro added 22,577 jobs in the year ending September 2015. This is solid annual job growth for us. What is interesting is how that breaks down geographically, depicted in the chart below. Nearly 40 percent of the metro’s new jobs last year were created in Jackson County (8,788). Johnson County followed with 5,491 jobs, or 24 percent of the total. Second place is an unfamiliar position for Johnson County, as it has clearly been the region’s job creator in recent years. But 2015 was not particularly good for Johnson County in terms of employment — in recent years, it has averaged closer to 8,000 new jobs annually. There are two big stories here. The first is Jackson County’s employment surge. Adding 8,788 jobs over the past year is well above its recent pace. The chart below highlights the recent surge. 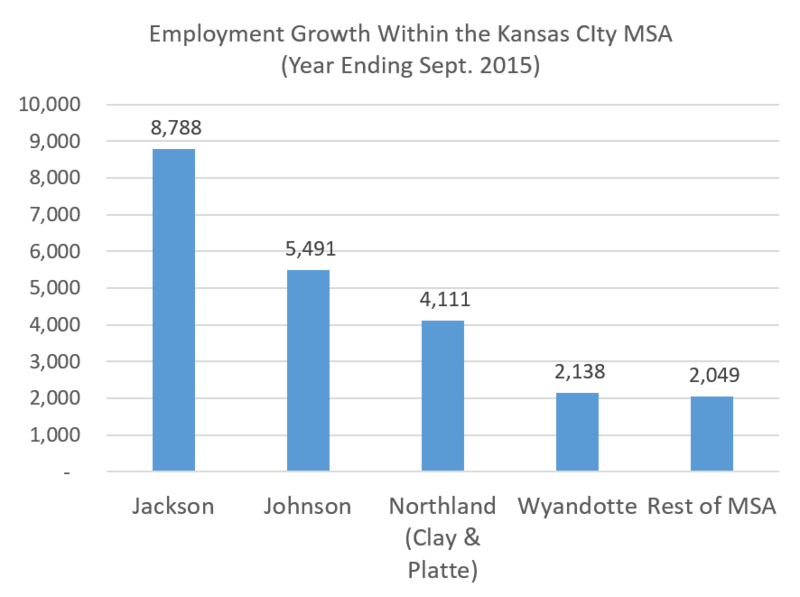 Second, the employment numbers for Johnson County (and the Kansas side of the MSA) are really remarkable when you look at the figures for the state as a whole. The Kansas side of the metro accounted for a whopping 97 percent of the total job growth in the state of Kansas (7,881 of 8,113 jobs). That bears repeating — 97 out of every 100 new jobs in Kansas were created in Johnson, Leavenworth, Miami or Wyandotte counties! As always, we have to caution that this analysis is based on fairly short-term trends. Jackson County’s surge could prove to be a temporary blip, while Johnson County could quickly recapture its title as the region’s job creator. We have to wonder if the factors that are causing weak job growth in Kansas are also impacting the metro’s potential job growth. We will continue to track this data and keep you posted. NOTE: The QCEW gives the most accurate picture of local employment, as it is derived from actual tax reports that businesses submit for unemployment insurance purposes. The drawback to this accuracy is the six-month lag time. 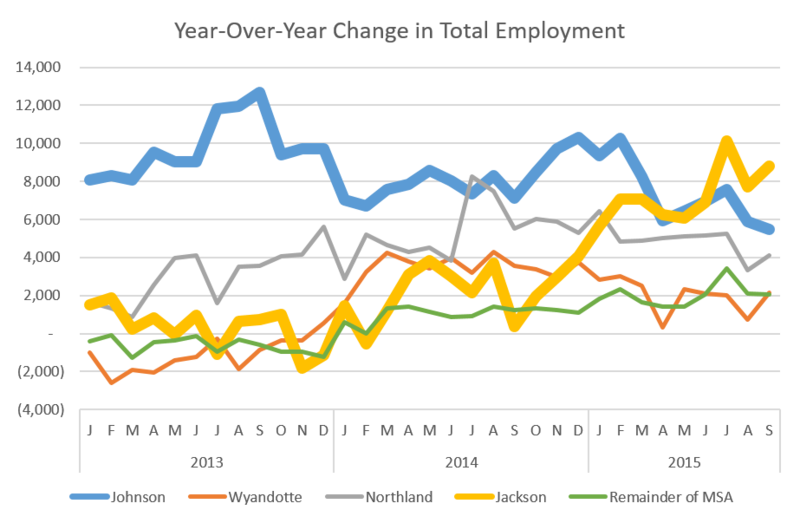 The QCEW also provides the baseline for other employment data, such as the Current Employment Statistics (CES) which we use for our monthly workforce report. We will release a new report later this month that will reflect this new QCEW data. The raw data used in this post can be found here. ← How Fulfilled Are You, KC?